Terrington St John tower mill stood on the south side of the village and used two pairs of patent sails to power 2 pairs of French burr stones, 1 pair of Peak stones, a screen and a flour mill. By 1898 the mill also had an 8 h.p. oil engine and a steam engine as two forms of auxiliary power. The oil engine could power all 3 pairs of stones, while wind wind power or steam power were each able to run some of the machinery. All that substantial and well built WIND CORN MILL (now in good trade) with patent Sails and Fantail, driving two pair of French Stones and one pair of Greys, including Gear Work, Dressing Machine and Flour Mill all in excellent condition. Also a good House with Baking offices, Stables, Granaries. Pigsties and every other suitable convenience, with a large Garden and Orchard well planted with Fruit Trees and about 6 acres of rich Pasture and Arable Land adjoining the same. The whole being situated in the populous village of Terrington St. John an equal distance between Lynn and Wisbech and surrounded by a highly respectable neighbourhood. Apply to Mr. Robert T. Wright, the owner or Mr. John Egarr, both at Terrington St. John. Apply to Mr. Robert J. Wright, the owner or Mr. John Egarr, both at Terrington St. John. A substantially built BRICK TOWER WINDMILL in excellent repair driving three pairs of stones, with dressing machines etc. and a well built Dwelling house adjoining containing six good rooms, with suitable Outbuildings, Bake house and oven, Granary, Stable and Gig house, Cart Hovel, pigsties, Yard and Garden planted with choice fruit trees, comprising altogether about 3 Roods of Land in the village of St. John. Copyhold of the Manor of Terrington. Valuable Estates at Terrington St. John & Terrington St. Clements, Norfolk. A Substantially built Brick WINDMILL in excellent repair driving three pair of stones, with Dressing Machines etc. etc. 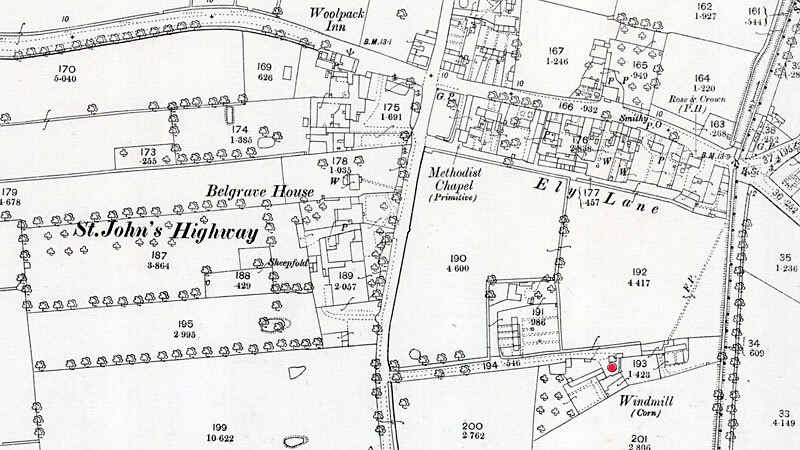 and a well built DWELLING HOUSE adjoining containing six good room with suitable Outbuildings, Bakehouse, Oven, Granary, Stable, Gig House, Cart Hovell, Pigsties, Yard and Garden planted with choice fruit trees, containing altogether about 3 roods of land, in the village of St. John. Copyhold. The Fine in the Manor of Terrington and Lovells is 4s. an acre and in Howards 5s. an acre. To be SOLD, a bargain, a pair of open French Stones, 4 ft. 6 in. well adapted for grist or barley work. Apply J. Wilson, Terrington St. John's. WANTED immediately, a young man in a tower mill with patent sails and fantail. Apply to J. Wilson, Terrington St. John, Lynn. ... two mills also lost several sails. 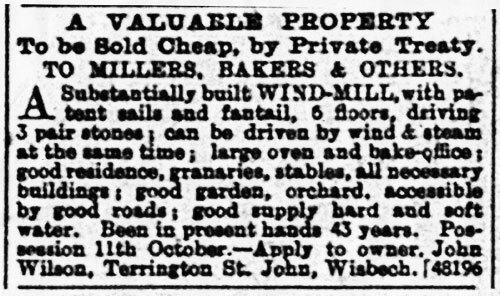 Have received instructions from Mr. John Wilson, the owner, to Sell by Auction at the Globe Hotel, Kings Lynn, on Tuesday 26 July 1898 at 4 o'c precisely, a valuable brick TOWER WIND-MILL, with patent sails and fantail, driving three pairs of stones, with screen and flour mill, a powerful two (amended on 1st July to 8) horse-power engine, capital residence, large bake office, oven with chamber over, ample stabling, barn, wagon loft, cart shed and all necessary outbuildings, standing on 1a. and 1r. of Land with garden and orchard, situate at Terrington Saint John, Norfolk. The whole premises are in excellent repair, well situated, accessible to good roads and a large trade has for the past 29 years been carried on by the proprietor, who is relinquishing business. Copyhold Manor of Terrington. Fine certain. Have received instructions from Mr. John Wilson, the proprietor, to Sell by Public Auction at the Globe hotel, Kings Lynn on Tuesday 26 July 1898 at 4 o'c in the afternoon precisely, subject to conditions which will then be produces, the following VALUABLE PROPERTY. A well built Brick TOWER WINDMILL, with patent sails and fantail, driving three pairs of stones, with screen and flour mill (a powerful eight horse power engine is attached) engine house, capital residence, large bake office and oven with chambers over, granary, stabling for 6 horses and 4 cows, large chaff and hayhouse, barn, piggeries, gighouse and wagon loft and all necessary outbuildings, standing in 1a. 1r. 0p. of ground with garden and orchard, situate in Terrington Saint John, distant ab0ut 7 miles from the market towns of Kings Lynn and Wisbech. All the machinery can be driven by the engine or partly by steam and partly by wind. There is good supply of hard and soft water. The whole premises are in excellent repair, well situate, accessible to good roads and a large trade has for the past 29 years been carried on by the proprietor, who is relinquishing business. A WELL BUILT Brick TOWER WIND-MILL, with patent sails and fantail, driving three pairs of stones, with screen and flour mill, (a powerful eight-horse-power engine is attached,) engine-house, capital residence, large bake-office and oven with chambers over, granary, stabling for 6 horses and 4 cows, large chaff and hay house, barn, piggeries, gig-house, wagon loft, and all other necessary outbuildings, standing on 1a. 1r. 0p. 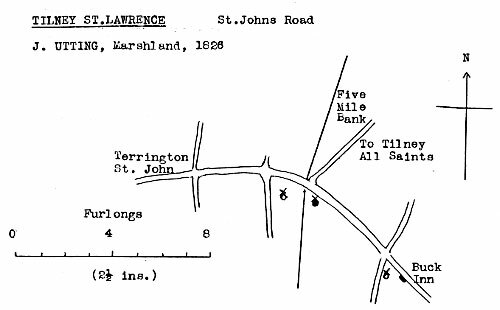 of ground, with garden and orchard, situate in Terrington St. John, distant about 7 miles from the market towns of King’s Lynn and Wisbech. All the machinery can be driven by the engine, or partly by steam and partly by wind. There is a good supply of hard and soft water. The whole premises are in excellent repair, well situated, accessible by good roads, and a large trade has for the past 29 years been carried on by the owner, Mr. John Wilson, who is relinquishing business. To whom apply. A WELL BUILT Brick TOWER WIND-MILL, with patent sails and fantail, driving three pairs of stones, with screen and flour mill (a powerful eight horse power engine is attached) engine house, capital residence, large bake office and oven with chambers over, granary, stabling for 6 horses and 4 cows, large chaff and hayhouse, barn, piggeries, gighouse and wagon loft and all necessary outbuildings, standing in 1a. 1r. 0p. of ground with garden and orchard, situate in Terrington Saint John, distant about 7 miles from the market towns of Kings Lynn and Wisbech. All the machinery can be driven by the engine or partly by steam and partly by wind. There is good supply of hard and soft water. The whole premises are in excellent repair, well situate, accessible to good roads and a large trade has for the past 29 years been carried on by the owner, Mr. John Wilson, who is relinquishing business. Comprising 5 excellent working horses ... MILLING UTENSILS, carriages and gears, including wagon, Scotch cart with raves ... together with a portion of the HOUSEHOLD FURNITURE. Sale to commence at 12.30 o'c. Begs to thank his customers for their kind support during the 34 years he has been in business and wishes to inform them that he has retired and disposed of the business to Mr. A. K. LONGBOTTOM, who he feels sure will merit a continuance of their support. Having taken over the business of Mr. J. Wilson begs to inform all customers that he will have great pleasure in serving them and by close attention to business hopes to receive a continuance of the patronage which has been enjoyed by his predecessor. On 23rd July 1973 Mrs. Pansy Ellen Purse wrote to Harry Apling to say that there was now a lawn where the mill once was but the bakehouse, stable and hay loft were still standing. There were two mills some distance apart, one with clockwise sails and on with anticlockwise. Both purchased by the late Henry (Herbert?) Cooper of Walpole Highway and dismantled, to use his own words, "To draw the trade to the Walpole Mill". Sunday 22nd February 1908: Mill damaged in a severe gale and "put out of order"